All lanes of the 15 Freeway in the Cajon Pass reopened and mandatory evacuations for residents were lifted Saturday night as hundreds of firefighters made progress in their battle to contain a wildfire that has scorched 3,500 acres in the mountains east of Los Angeles, officials said. More than 800 firefighters backed by air tankers and dozers faced unseasonably stormy weather as they tried to put out the so-called North Fire. 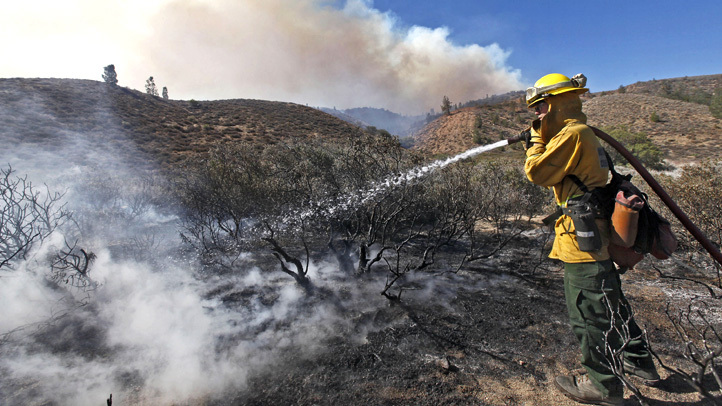 The blaze was 45 percent contained as of 7 p.m. Saturday, officials with the U.S. Forest Service said. Residents were allowed back into their homes, but required to provide identification at a checkpoint at the intersection of Baldy Mesa and Phelan roads in order to do so. The evacuation order was issued shortly after the fire erupted at 2:33 p.m. Friday for residents of the Baldy Mesa area east of Sheep Creek Road, north of Highway 138, south of Phelan Road and west of Highway 395 and the 15 Freeway. Many terrified residents had only a split-second to flee the flames. Homeowners near the Cajon Pass recall the terrifying moments when the North Fire rapidly moved towards their property. 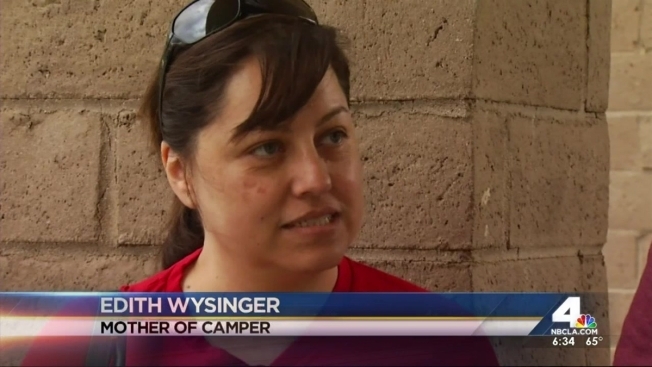 Melissa Etezadi reports for NBC4 on Today in LA Saturday, July 18, 2015. "I could see the fire, I was going to evacuate anyway," one resident said. "I saw it come over the ridge and it was moving so fast. The wind was blowing up here about 40 miles an hour and the fire was heading straight for us, so I was getting out anyway." An evacuation center was set up for residents at Serrano High School in Phelan and animals at the Victor Valley Fairgrounds in Victorville. Up to 244 people fled to the school Friday and nearly 200 were at the shelter Saturday. “A lot of people were paranoid and scared about what to do, but we really tried to calm everybody down and the whole process went as controlled as possible,” said Andrew Choo, a children’s camp counselor, through a sign language interpreter. The Baldy Mesa community bore most of the damage caused by the North Fire, with a total of three homes, eight outbuildings and 44 vehicles destroyed, according to Forest Service officials. Stormy weather brought increased moisture into the area, but the threat of lightning was a concern for firefighters. 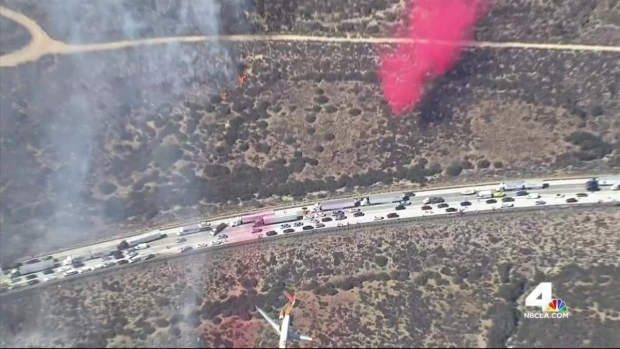 Both sides of the 15 Freeway were closed Friday when the fast -spreading brush fire jumped the roadway. Flames engulfed vehicles that had become stranded. Some drivers and their passengers fled on foot and others took to unmarked dirt roads through the desert to escape the inferno and billowing thick-black smoke. Officials said several drones delayed aerial firefighting efforts deployed to the so-called North Fire on Friday. Robert Kovacik reports for NBC News at 11 on Friday, July 17, 2015. 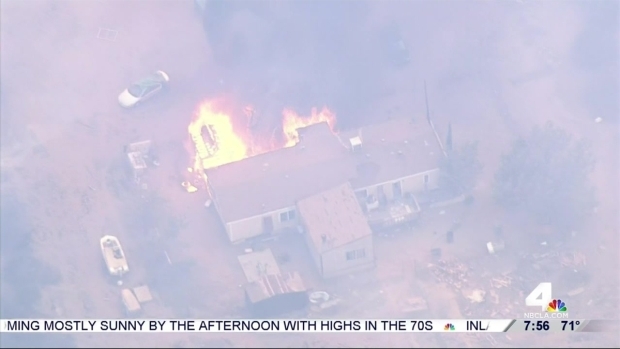 NBC4 viewers shared dramatic images of the fire as it ripped through the dry brush. One video showed horses fleeing the fire on a roadway next to drivers also escaping flames. A drone temporarily forced the landing of planes deployed to fight the fire, delaying initial response times by about 25 minutes, according to the San Bernardino County Fire Department. The cause of the fire remained under investigation Saturday. Melissa Etezadi contributed to this report.